HOW CAN IT BE SO GREAT WHEN NOBODY KNOWS WHAT IT IS? Rarely has there been such a triumph of image over substance; rarely such an outpouring of admiration for a deal, whose details yet remain a secret, as there has been this week in the wake of the Trans-Pacific Partnership free trade announcement. "A gigantic foundation stone for our future prosperity," gushed the PM as business groups pumped out their press releases with zeal. On the TV news, the networks ran their panegyrics to the TPP even higher in the bulletin than the nightly Prince Harry segment. If this is such a great deal, why are they hiding it? There is, among other things, a four-letter answer to this question: ISDS (Investor-State Dispute Settlement). ISDS is a mechanism for corporations to sue governments. Pharmaceutical giant Ely Lilly is suing the government of Egypt for lifting the minimum wage. Canada is being sued for a ban on fracking and Germany for its phasing out of nuclear power; all actions taken under ISDS clauses in free trade pacts. US corporations are the biggest litigants, having brought some 127 cases thus far against sovereign government decisions which they claim have damaged their financial interests. Taxpayers have the pleasure of footing the legal defence bills. Even worse, the authority of sovereign courts is ignored in favour of an international dispute tribunal. The reality is this TPP free trade deal is as much about free trade as it is about entrenching the interests of large multinational corporations. It is no secret that, while the citizens of the 12 signatory nations remain in the dark about the detail of the regional free trade pact, multinationals and their lobbyists had a large hand in shaping it. The US has a system of trade consultative committees. There are some 600 "cleared advisers" who consult to government. Of those, about 550 hail from the corporate sector; the rest a smattering of union, community and environment groups. The cleared adviser has to sign a confidentiality contract and cannot talk about the deal but is free to give detailed advice to government. Besides this leg-up for vested interests, there is the potent influence of money in politics. During the 2008 election campaign, there was $US5.8 billion ($7.7 billion) in political donations. Some $US3.6 billion was splashed on the 2010 mid-term elections. Wall Street, the health and pharmaceutical sectors, oil and gas, telecommunications, weapons manufacturers and real estate are among the biggest donors, and account for the bulk of the annual billion-dollar lobbying spend. Washington has largely been bought off. Washington is driving the TPP process.Washington kow-tows to corporate interests, and Canberra, in turn, kow-tows to Washington's interests. Australians therefore can have little comfort that the detail in the TPP will turn in their favour. So it is that we are subject to a PR blitz. "Free trade" is the branding. It is hard to argue with free trade. In principle, free trade is good. But what is the trade-off? 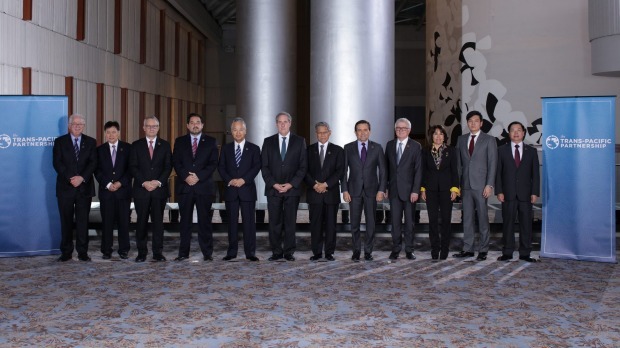 By the time the detail is forthcoming in a month, people will be tired of the TPP - old news - and its architects of the hope that the barrage of flattery will render the deal a fait accompli. Instead of a full TPP text, which can be credibly analysed and discussed by the people who elect governments, we have a press release which sums up all thirty chapters of the agreement with a few sentences for each chapter. Chapter 10 on Cross Border Trade in Services for instance contains seven sentences and refers to two "country-specific annexes attached to the agreement". These presumably relate to exceptions for two countries but the "annexes" themselves are nowhere to be seen. Australia does a large trade in services – education, financial services and the likes. Are we one of these exceptions? Trade Minister Andrew Robb has won plaudits from far and wide in the business lobby, notably for sticking to his guns on changes to the rules on patents and generic drugs. Yet, with the detail of the deal invisible, there appears to be a contradiction in the American interpretation of these very same arrangements. As Patricia Ranald of the Australian Fair Trade and Investment Network (AFTINET) puts it, Andrew Robb has given assurances that Australia "has not agreed to immediate extension of monopolies on life-saving biologic medicines beyond the current Australian standard of five years". "The US government was seeking an extension from five to eight years which would cost the Pharmaceutical Benefits Scheme hundreds of millions of dollars for every year of delay for cheaper versions to become available," says Dr Ranald. "This would lead to pressure for higher prices at the chemist. "However, we note these assurances are weakened by the fact that the US is claiming that five years is a minimum standard and there is a "voluntary" agreement using administrative means for an additional three years of monopoly on biologics, referred to as 'five years + three years'. Without the detail of the text it is difficult to know exactly what impact this will have." Yes, falling tariffs will help farmers and other exporters. Lower barriers to trade for these countries comprising 40 per cent of the world's economy are a good thing. There is a dismal failure however by the proponents of free trade pacts to do an independent cost-benefit analysis before they are signed (as the Productivity Commission would like to do). And there is an equally dismal failure to justify free trade deals by credible historic analysis. What for instance has been the upshot of the US-Australia free trade agreement struck as the quid pro quo for Australia joining the invasion of Iraq in 2003? How has that favoured the US vis-à-vis Australia's national interest? FTAs are largely an article of faith. To criticise them sounds pernickety given the prevailing public sentiment that they sound like a good thing, so they must be a good thing. There is little doubt however that the TPP will do as much to promote free trade as it will to cement the power of large corporations who are inexorably usurping governments around the world. If governments don't have the courage and the nous to stand up to multinational tax avoiders – many of who are the leading proponents of this deal - how can the public trust them to ensure the best outcome in a free trade deal struck in secret? Under these circumstances, signing up to the TPP is a bit like buying a used car over the phone with no detail as to the state of the vehicle or the clicks on the odometer, but with glowing assurances from the dealer that "she's a beauty".